As early as 1976 in the December issue of the 356 Registry, Vol. 3, No.2, then 356 Registry Reviews Editor, Bob Lawrence of Coram, New York wrote: "For four years now I have been maintaining a Convertible D Registry. While I consider this to be the rarest true production Porsche, I wonder if the attrition rate could be as high as would seem to be indicated by the few (50) D's registered to date." 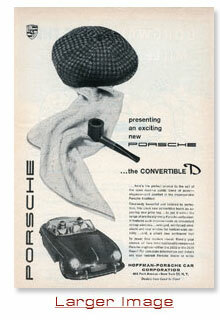 It seems that Bob actually started the Convertible D Registry 2 years before the 356 Registry was established! Since correspondence was mainly done by letter, news of sales and registrations traveled slowly, if at all. At that time, computers and email weren't in the hands of the average car enthusiast. On the West coast in the late 80s and into the 90s, John Norton in California had also decided to begin listing Convertible Ds while attempting to buy one. Admitting that his list was started mainly to track the cars and asking prices, his list grew to over 100 Ds and he ended up sharing his information back with "registered" owners for a short time. Norton has since sold his Convertible D and is not maintaining a list. 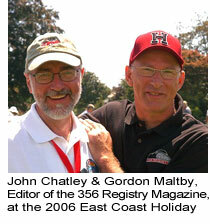 The current "registrar" and "caretaker" of the information, John Chatley of Lake Orion, Michigan (shown at left with Gordon Maltby, editor of the 356 Registry magazine), began admiring 356s and Convertible Ds in 1988-89 when he joined the 356 Registry after switching from owning MGs and being the President of the Canadian-US, "Windsor-Detroit MG Club" in the mid-80s. John began developing a list of advertised and noted Ds in hopes of one day owning one. As his list grew, he shared information with Norton in California, but this became difficult due to each using different computer programs on very early personal computers. After a six-year hiatus vintage racing a '59 356A coupe, Chatley sold his race car and found the Convertible D he had been hoping for in 2003. With his interest renewed, John contacted Norton and Lawrence, as well as Dr. Bill Block, the registrar of the 356 Registry, to assemble all of the known Convertible D lists into one comprehensive database. While visiting with a large group of Convertible D owners at the Speedster 50th Anniversary in Monterey, California in June, 2004, possibly the largest Convertible D gathering (35-40 Ds) in recent history, Chatley was urged by their enthusiasm to re-establish the Convertible D Registry. John then enlisted the programming and web expertise of 356 owners Heath Hurlbert and Barry Lee Brisco to refine a database program into which all lists' info could be combined and a website built to show some of that information. With today's ease of computer email communication, John has been attempting to reach out to many D owners and enthusiasts around the world, putting together the largest international Conv. D list to date, and also attempting to gather information that clarifies original equipment and other aspects of this rare car.